Now that the students had inquired into how they could make their observed environmental sounds into musical sounds (inspired by Paul Showers’ The Listening Walk; see my Part I and Part II posts), we took it a step further. 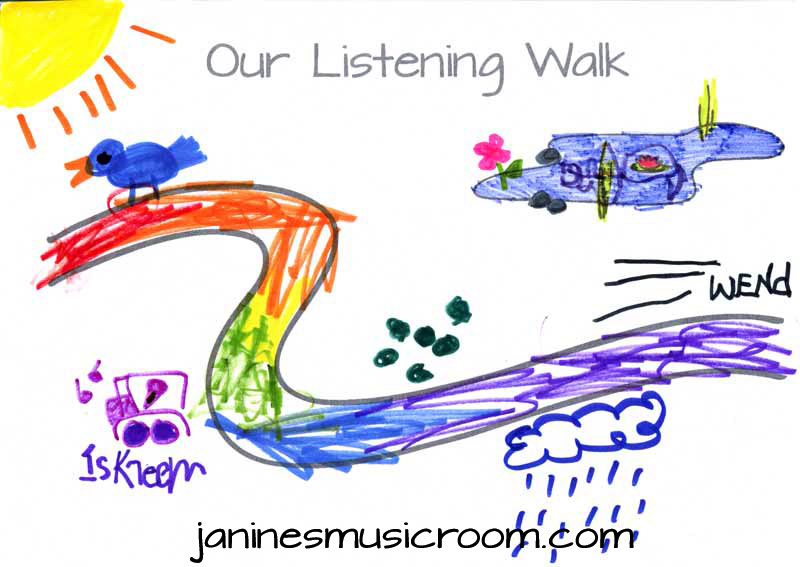 We visualized the listening “walk” as a kind of score, or a path, that we could follow. Like a musical score, the sounds could start and stop at specific times; they could overlap or repeat. Each group chose five sounds they might encounter on their musical listening walk. They drew their sounds along this path, discussing the order from whatever perspective they chose. Then they refined and practiced each sound, thinking about dynamics and texture. Finally, they chose a “conductor” who would trace the path to direct the musicians in their performance, showing the timing and duration of each sound. As we imagined traveling the path, one group even thought about tapering dynamics upon approaching and walking away from each sound! Before this inquiry, I hadn’t thought to talk about following a score in Kindergarten. 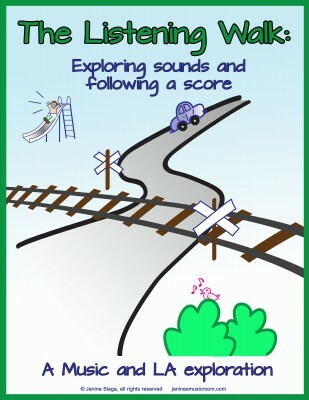 How do you explore graphic notation or graphic scores in your Early Years classes? This is great too. Do you actually use all the music vocabulary with the Early Childhood classes? I find that they can’t remember what all the words mean. Thanks! Yes, I use the vocabulary. They may not remember all the terms, but every chance for exposure to the vocabulary is great! And there are always children who will start using the music terms whenever they can.